I am hoping someone can help us with a problem we are having with our Dometic refrigerator. The fridge seems to be having trouble staying cold and the freezer tries to thaw itself from time to time. The first thing to go wrong with it was the ice maker. It just stopped working and I have an ice flow in the back of the ice tray. I am assuming this fridge came with the coach. We have a 2007 Monaco Knight. We have called a lot of RV repair folks and no one wants to work on it. It appears to be a lemon of a fridge from the get go from what I have read. I would be interested to know if any one else has or had this fridge and whether they had trouble with it. What (if anything) fixed the problem for you? These are expensive to replace so I hope I can fix it ourselves. We've only had our coach since Dec of last year so I don't have a lot of time with it. But we have only had one issue where the ice maker was 'hanging' up with frozen water (not really ice cubes) in the chute. I cleaned/melted the ice with warm water and it worked fine for the rest of our trip and the next trip. I don't use the ice maker unless I am going to be using the coach for a week or more (parked). I have seen it go into defrost mode but this is normal. The only other issue is that it takes awhile to get to temp when I first start it up....so I have been putting in some frozen water bottles the night before I want to load it up and by the next morning it is 4-6 degrees freezer....34-36 degrees in the fridge. Once cold it works fine and holds the temps. Are you getting any errors/messages in the LED display? Are you running on electric or gas? Thank you for your quick reply tankcj. There is no error message and I am running the fridge on electricity while we are parked. I did the same thing with the ice maker and it worked for a while then it failed to make ice again. What is your typical temps on the fridge and freezer? If the freezer is in the 4-6 degree range, did you check you valve for the water supply line to the ice maker to make sure it is open so that there is adequate water supply/pressure? I am by no means an expert but just trying to compare your settings and temps to mine to see if there is something out of whack. Having just pulled my Dometic 1402 out I have parts for sale if you need. Mine did similar to what you described and once I turned the fridge off and let it sit for a day or two everything in the freezer that had frozen up thawed out and it worked again. But like Bill said they are not very efficient and the ice maker struggles if its above 90 degrees outside. I wouldn't spend a lot to fix it as it's not worth it. Thanks every one. We have learned about the problems with this fridge and are looking at replacing it with the Samsung model mentioned here. We had Samsung appliances in our home and we were quite pleased with them. The temp gauge for the freezer says 2.5. The fridge says 33. We will check the water line to the ice maker. I have been making sure to shut the door firmly to the freezer and that seems to be helping. We noticed the previous owners had to replace the door because of similar problems. We are in Mesa, AZ and the temps were in the 90's the last time we noticed things thawing in the freezer so the temperature may indeed have an effect. We finally found someone that will take a look at the fridge next week. Although he did so reluctantly as he too says this particular fridge never worked efficiently from the beginning. We will see what he has to say then go from there. One of the windows on the driver's side is fogged up so we have to take it out anyway. Maybe we will kill two birds with one stone and replace the fridge at the same time. Thanks for all your help. We are newbie's and these forums really help a lot. Acording to the manual, the digital readout is showing the estimated temp of the food in each compartment. 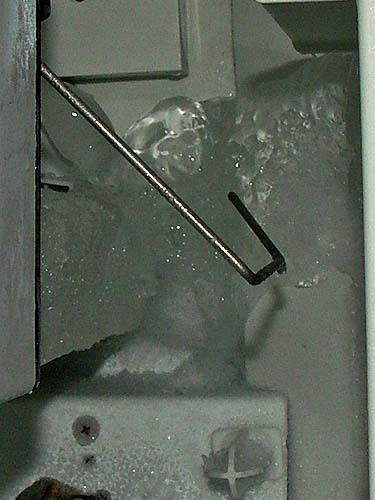 As for the ice buildup on the back wall behind/ below the ice maker, I had that happen after pulling the ice maker to replace a burned out defrosting element. Pulled it back out about 4 weeks ago to see if I could see anything. Where the water tube that supplies the ice maker sticks out of the back wall, (and it does need to stick out 1/4" or so) there is a bead of putty that seals around the 'U' shaped cutout, in a square water dispenser. This putty kind of takes a set when the ice maker is originaly installed. If the seal get's disturbed when the ice maker is re-installed, the water can run down the back side, freeze, and screw a few things up,( the dispenser auger motor, and switch that changes cubes, or shaved ice being two of them). I simply formed the putty back into a round bead, around the tube again before re-installing the ice maker, then once all was tightened down, could just get my fat finger back there to press the putty tight around the dispenser box. Ice maker has worked perfectly since, and no ice buildup on back wall. I have had several issues with my NDA1402. I've been able to work around most of them, and it pretty much works, but I'm not generally thrilled with it. We spend a lot of time dry camping with no hookups, so having the ability to cool with propane and not draw down the batteries is important to us, therefore I don't see us replacing it with a residential style fridge. I've had times where it didn't cool very well. Once was only when on gas, and during a cleaning/servicing of the fridge, I found a brass sliver (probably from manufacturing) blocking most of the gas orifice. I cleaned that out and it cooled much better. A couple times poor cooling has been caused by a failed fan thermostat. My fridge is in a slide, so it doesn't have a roof vent, just an upper wall vent. The natural draft is not as good as if it would've had a roof vent, so there are a set of fans mounted behind the fridge to force a cooling draft. These fans are controlled by a small thermostat attached to the upper cooling fins. When this fails, the fans never run. I've replaced the thermostat a couple times, and now I keep one handy as a spare. If yours fails, and you don't have a spare, you can temporarily pull the wires off of the thermostat and short them together -- this makes the fans run constantly. I've had issues with the entire upper freezer compartment icing up, forming frost and thick ice on the upper freezer walls. It turned out the freezer door was warped and letting in air/moisture. This was replaced under warranty, and it's been much better since. I've had the rather common ERR 13 message, which indicates is a failed defrost heater. Details are here: My Dometic Freezer and Ice Maker are acting up! Error Code 'CALL ERR 13' This is apparently a common issue, as it is difficult to put the tail of the heater into the drain tube while keeping it straight -- if the heater tail gets bunched up and folded onto itself, it causes a hot spot and burns through. While it's supposed to be a frost-free refrigerator/freezer, I do have issues with it icing up over time. Generally, after three or four months of continuous operation, I need to defrost both the refrigerator and freezer. I just turn off the power, and leave it open for a day or so to let everything melt. Then turn it on and in a day or two (depending on the outside temperature) it's ready to go again.